To win, Sanchez will likely need around a third of Democrats, the vast majority of Latinos and more than half of independents and Republicans to cast their ballots for her. A Field Poll released Friday showed Harris with a 15-point lead (39 percent to 24 percent). The good news for Sanchez was that 22 percent of respondents were undecided, the bad news was that 15 percent — a large portion of which were Republicans — said they’d vote for neither. Harris led among voters in nearly every category, including among Republicans, independents and Southern California voters (Harris is from the Bay Area). Sanchez, however, had a strong lead among Latinos, a nice lead among voters ages 18 to 39, and a slight lead among voters making less than $40,000 annually. Perhaps the most troubling data point for Sanchez was the 31 percent of Republicans who said they wouldn’t vote in the Senate race, essentially saying they would just skip over that race on the ballot without one of their own to choose from. Mike Madrid, a Republican consultant who specializes in Latino issues, said he doubted the Republican undervote will be as “significant as other Democrat demographics” and believes Sanchez has a chance to win in November. Sanchez walks a fine line in appealing to Latinos and Republicans, as the former is increasingly dissatisfied with the latter. And she can’t veer too far to the right and hope to win a large chunk of Democrats or vice versa. After all, Sanchez is still a partisan Democrat and has strong support from Democratic lawmakers and constituencies, including unions. While some Republican insiders have reached out to Sanchez, introducing her to donors and voters behind closed doors, few are willing to make overt displays of support. Republicans like Hewitt who have come out in support of Sanchez give cover to other Republicans who may have a tough time voting for a Democrat by finding her to be the moderate candidate, or at least the lesser of two evils. The Libertarian-leaning Orange County Register Editorial Board endorsed Sanchez during the primary (while Republicans were still in the race), primarily for voting against the Iraq War in 2003, for voting against the PATRIOT ACT (which expanded the federal government’s use of surveillance against U.S. citizens), and for opposing the 2008 bank bailout. Hewitt called her the more “moderate” of the two candidates and said he would occasionally find consensus with Sanchez in military and defense issues — Sanchez sits on the House Armed Services Committee and the House Homeland Security Committee. In June, Richard Riordan, the former Republican Mayor of Los Angeles, endorsed Sanchez for her opposition to the Iraq War and for her ability to work across the partisan aisle to pass legislation. Congressional Quarterly recently listed Sanchez as one of the 25 most influential women in Washington, for being a “debate shaper and swing vote.” For the majority of her nearly two decades in Congress, she’s been in the minority party, meaning most accomplishments have been made with an element of compromise. Sanchez actually used to be a Republican, dating back to high school in Anaheim. But similar to Latinos today repulsed from the Republican Party by its presumptive presidential nominee, Sanchez switched when she heard former Republican presidential candidate Pat Buchanan warn of the “illegal invasion” of Mexicans coming across the country’s southern border, according to the Los Angeles Times. 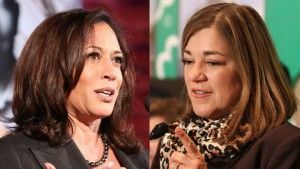 Even if Sanchez can unite behind her Republicans, Latinos, independents and leftover Democrats, she still faces an opponent in Harris who has statewide name recognition and the full backing of the Democratic establishment, which in California has so often proven to be enough. For every play she makes for one group, she risks alienating voters of another group. Democratic consultant Steve Maviglio said, for example, attacking Harris, the attorney general, as being soft on crime was a decent strategy, but risks losing appeal among progressives. And despite Sanchez’s moderate profile as a member of the fiscally conservative Blue Dog Caucus and her independent streak on larger issues, she still has a fairly liberal voting record in the House.